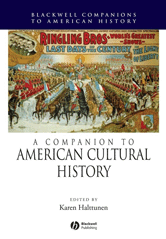 A Companion to American Cultural History offers a historiographic overview of the scholarship, with special attention to the major studies and debates that have shaped the field, and an assessment of where it is currently headed. Essays explore the history of American culture at all analytic levels. - Written by scholarly experts well-versed in the questions and controversies that have activated interest in this burgeoning field. - Provides both a chronological and thematic approach: topics range from British America in the Eighteenth Century to the modern day globalization of American Culture; thematic approaches include gender and sexuality and popular culture.